We actually have two water footprints: direct and indirect. Many of us are familiar with direct water-use footprint, and mat already be taking steps to reduce it: taking shorter showers, not letting the water run while we’re brushing our teeth, doing fewer loads of laundry, flushing the toilet less often or even installing low-flush toilets. We probably don’t think of our indirect water footprint often if at all, which involved the water used to make the products and services we use. Author Stephen Leahy, an Ontario-based environmental journalist, wrote about some of them in his book Your Water Footprint published earlier this year. 2. Think about what you drink. 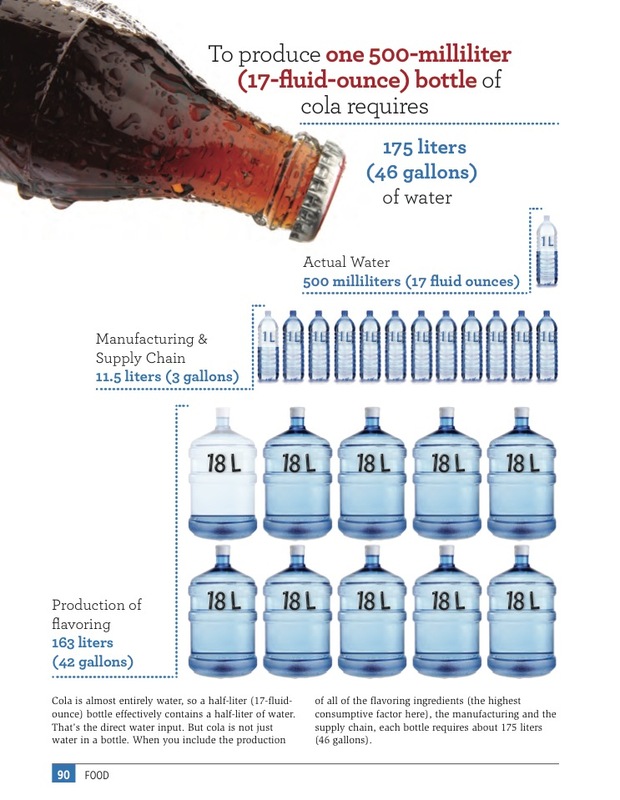 Tell people you’re passing on the soft drink and going for a beer because its water footprint is lower. And it is. A beer takes about 20 gallons of water to create, while soft drinks can be close to 50, depending on packaging and what sugars are used. And drink tea instead of coffee. Coffee consumes about 37 gallons of water in the production process, tea takes only 9 gallons. 6. Don’t install or use a garbage disposal. It’s water intensive. Compost instead. 8. If you have a garden, install rain barrels to conserve water instead using that hose. Rain barrels hook up to your downspouts and collect rain water to reuse. You can make one from a 55-gallon drums (more recycling) and a easy-to-find little hardware. There’s a big movement among artists to paint rain barrels so that you can also have a distinctive and colorful work of art outside your house. There’s lots more information about your water footprint and what you can do to reduce it at WaterFootprint.org. 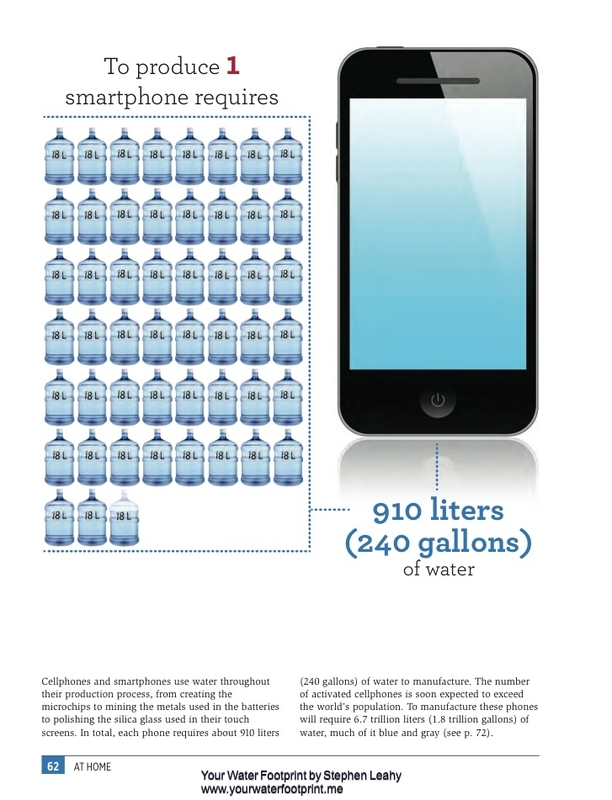 They even have a calculator so you can figure out your own water footprint. Did you know that the average North American lifestyle is kept afloat by about 7,600 litres of water a day? We’re not talking trying to cram in more than the eight glasses recommended for our health – we’re talking about how much water it takes to propel our lives. A new book written by Uxbridge resident and award-winning environmental journalist Stephen Leahy gives shocking insight into the “water footprint” that we use each day. We’re all familiar with the term “carbon footprint”, and this new term can be jarring when first learned, as it’s not likely something you’ve heard about before. Open up Your Water Footprint: The Shocking Facts About How Much Water We Use to Make Everyday Products and you’ll quickly learn that the world’s most abundant resource is also the world’s most abused. The book was originally commissioned by Firefly Books after a publisher there read “A Cup of Coffee with Stephen Leahy” in The Cosmos about two years ago. 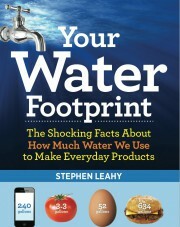 Your Water Footprint is easy to read, with lots of what Stephen calls “info graphics”. There is lots of reading to be done, but each picture does an excellent job of telling a story, and although the facts each chapter pours out (pun semi-intended) can be overwhelming, they are captivating and eye-opening. Take a pair of jeans, for example. One pair of jeans takes 7,600 litres of water to make. Much of the cotton from which jeans are made grows in India. Water is needed to irrigate the cotton crops, and it comes from nearby rivers. Once the raw cotton is harvested, it must be washed. More water use. It is then shipped to Bangladesh – the fuel used in the vehicle(s) that transport it requires water, as do the vehicles themselves. The cotton is processed further, being spun and dyed (more water in the dye), and the now-contaminated water often lands back in the rivers it came from. Eventually the finished garment gets a couple more washes, and the jeans get packaged up and shipped off to retailers – more fuel, more transport, more water. 7,600 litres doesn’t seem so unreasonable. Stephen says he learned a great deal writing the book, as he had been more involved in other environmental issues. The book is already starting to be used in some schools, in classes as young as grade six. 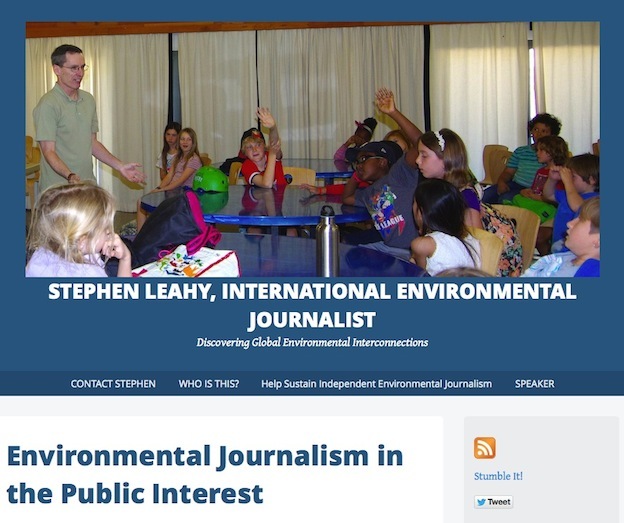 As a freelancer, Stephen writes mainly for Inter Press Service, a news agency that claims to be the world’s leading provider of news and analysis on sustainable development. Stephen covers topics ranging from climate change, energy, water, biodiversity, development, to native peoples, and his work often takes him all over the world. He will be at Blue Heron Books this Saturday, November 8, from 1 – 4 p.m., to officially launch Your Water Footprint: The Shocking Facts About How Much Water We Use to Make Everyday Products, as well as answer any questions that readers may have. Your Water Footprint will definitely change the way you look at every day life – from the food you eat to the way you consume household products.